My edition: paperback, published on 24 April 2014 by Avon, 483 pages. Description: Daisy has lost her mum to breast cancer. She's at rock bottom and doesn't think she'll ever get back up again. Her best friend Abi has other ideas – she tells it like it is and she's determined to make Daisy remember the person she used to be. What Daisy doesn't know is that, thanks to Abi, her life is about to take an unexpected turn, when she signs them up to do a charity walk. Added to which, someone is about to burst into Daisy's world in a riot of colour reminding her that life can be full of surprises. I don't give negative reviews lightly, but despite my best efforts I couldn't find many redeeming qualities within this novel. 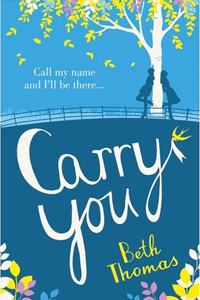 I usually love books published by Avon and they tend to find exactly the kind of novels I enjoy reading and the stunning cover of Carry You combined with the breast cancer storyline made this sound like another one right up my alley. Unfortunately I shouldn't have judged this book by its cover. It went wrong as soon as we were introduced to main character Daisy, who was extremely annoying throughout with her selfish attitude. While I certainly understand and feel sympathetic towards what she has been through (in fact it's extremely close to my own heart), her actions were contradictory and were more resembling that of a whimsical teenager than that of a grown women going through a difficult period in her life. The endless amount of Facebook postings, degrading the English language into unintelligible netspeak and smiley faces (something that already annoys me greatly in real life and I certainly don't need reminding of in a novel) didn't help. Add to that the fact that the part of her past hanging as a guilt cloud over her life didn't add up (it was taken hugely out of proportion and while I can see why she felt this way it did not explain the actions of her stepfather and siblings) and the whole reason for her behaviour didn't ring true at all. This led to a very unsatisfying (almost vindictive) ending, which didn't make sense in the bigger picture. And for all the talk of walking the MoonWalk in favour of breast cancer research, not once is fundraising mentioned. How is just walking a walk supposed to help? One of the other gripes I have with the novel is the extremely poor research. For example (the following takes place over the span of a handful of pages), the main protagonist is remembering something that happened in her life about 13 years before: She watched the movies Up and The Hills Have Eyes on a plane journey (these films weren't released until 2009 and 2006 respectively), she sat next to a woman playing Candy Crush Saga on a laptop (not released until 2012, plus I'm fairly certain all electronic devices needed to be turned off in planes 13 years ago) and when she visited New York she went to the 9/11 memorial (the attacks didn't happen until 2001 and the memorial opened to the public in 2011). These mistakes so closely following one another took me completely out of the story and after that I could no longer get back into it. There were some positives to the novel, in particular the character of Felix who, while only present briefly, felt more real and developed than Daisy. Unfortunately the negatives far outweighed the positives and while I find it difficult to harshly criticise an author's work when she's spent months and months writing her novel and pouring her heart and soul into it, despite my best efforts to find redeeming qualities within the story there were too many issues for it to be deserving of any more than two stars from me. Please note: I read a proof copy of the novel and so the mistakes I chose as examples above have been corrected in the final version. Unfortunately this doesn't change my opinion of the novel as a whole as I still feel too strongly about the aggravating selfish tendencies of Daisy, the excessive yet unnecessary additions of Facebook postings and the overall focus of the story. Ah sorry you didn't enjoy this one Zarina and to has such a lovely cover! Thanks, Laura! It's such a shame as I really thought I would love this novel, but it sadly wasn't one for me.